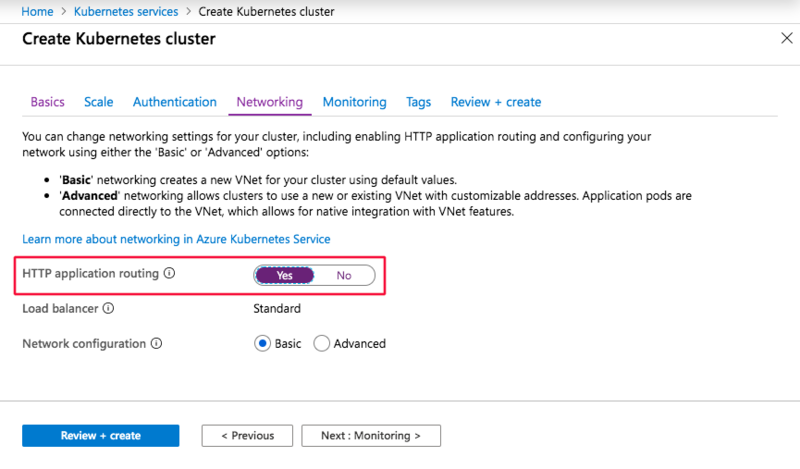 HTTP 應用程式路由解決方案可讓您輕鬆存取已部署至 Azure Kubernetes Service (AKS) 叢集的應用程式。The HTTP application routing solution makes it easy to access applications that are deployed to your Azure Kubernetes Service (AKS) cluster. 啟用此解決方案時，它會在 AKS 叢集中設定輸入控制器。When the solution's enabled, it configures an Ingress controller in your AKS cluster. 部署應用程式時，此解決方案也會針對應用程式端點建立可公開存取的 DNS 名稱。As applications are deployed, the solution also creates publicly accessible DNS names for application endpoints. 啟用附加元件時，它會在您的訂用帳戶中建立 DNS 區域。When the add-on is enabled, it creates a DNS Zone in your subscription. 如需 DNS 成本的詳細資訊，請參閱 DNS 定價。For more information about DNS cost, see DNS pricing. HTTP 應用程式路由附加元件依設計可讓您快速建立輸入控制器，以及存取您的應用程式。The HTTP application routing add-on is designed to let you quickly create an ingress controller and access your applications. 不建議將此附加元件用於生產環境。This add-on is not recommended for production use. 若要進行包含多個複本和 TLS 支援的生產環境輸入部署，請參閱建立 HTTPS 輸入控制器。For production-ready ingress deployments that include multiple replicas and TLS support, see Create an HTTPS ingress controller. 附加元件會部署兩個元件：Kubernetes 輸入控制器和 External-DNS 控制器。The add-on deploys two components: a Kubernetes Ingress controller and an External-DNS controller. 輸入控制器：輸入控制器會使用 LoadBalancer 類型的 Kubernetes 服務來向網際網路公開。Ingress controller: The Ingress controller is exposed to the internet by using a Kubernetes service of type LoadBalancer. 輸入控制器會監看並實作 Kubernetes 輸入資源，以建立應用程式端點的路由。The Ingress controller watches and implements Kubernetes Ingress resources, which creates routes to application endpoints. External-DNS 控制器：監看 Kubernetes 輸入資源，並在叢集特有的 DNS 區域中建立 DNS A 記錄。External-DNS controller: Watches for Kubernetes Ingress resources and creates DNS A records in the cluster-specific DNS zone. 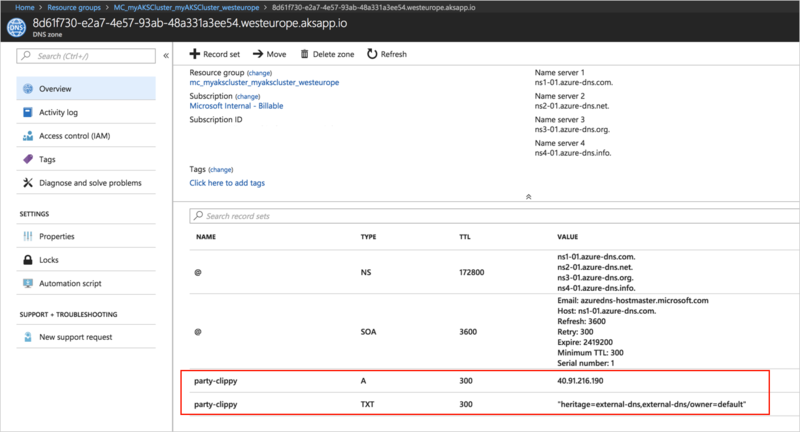 部署 AKS 叢集時，可以使用 Azure CLI 來啟用 HTTP 應用程式路由附加元件。The HTTP application routing add-on can be enabled with the Azure CLI when deploying an AKS cluster. 若要這樣做，請使用 az aks create 命令並搭配 --enable-addons 引數。To do so, use the az aks create command with the --enable-addons argument. 如果您想要啟用多個附加元件，請以逗號分隔的清單來提供它們。If you want to enable multiple add-ons, provide them as a comma-separated list. 例如，若要啟用 HTTP 應用程式路由和監視，請使用格式 --enable-addons http_application_routing,monitoring。For example, to enable HTTP application routing and monitoring, use the format --enable-addons http_application_routing,monitoring. 部署或更新叢集之後，請使用 az aks show 命令來擷取 DNS 區域名稱。After the cluster is deployed or updated, use the az aks show command to retrieve the DNS zone name. 需要此名稱，才能將應用程式部署至 AKS 叢集。This name is needed to deploy applications to the AKS cluster. 部署 AKS 叢集時，可透過 Azure 入口網站啟用 HTTP 應用程式路由附加元件。The HTTP application routing add-on can be enabled through the Azure portal when deploying an AKS cluster. 部署叢集之後，瀏覽至自動建立的 AKS 資源群組，並選取 DNS 區域。After the cluster is deployed, browse to the auto-created AKS resource group and select the DNS zone. 記下 DNS 區域名稱。Take note of the DNS zone name. 需要此名稱，才能將應用程式部署至 AKS 叢集。This name is needed to deploy applications to the AKS cluster. 建立名為 samples-http-application-routing.yaml 的檔案，然後將下列 YAML 複製進來。Create a file named samples-http-application-routing.yaml and copy in the following YAML. 在第 43 行上，使用本文上一個步驟所收集的 DNS 區域名稱來更新 <CLUSTER_SPECIFIC_DNS_ZONE>。On line 43, update <CLUSTER_SPECIFIC_DNS_ZONE> with the DNS zone name collected in the previous step of this article. 使用 kubectl apply 命令來建立資源。Use the kubectl apply command to create the resources. 使用 cURL 或瀏覽器來瀏覽至 samples-http-application-routing.yaml 檔案 host 區段中所指定的主機名稱。Use cURL or a browser to navigate to the hostname specified in the host section of the samples-http-application-routing.yaml file. 應用程式最多需要一分鐘的時間，就能透過網際網路使用。The application can take up to one minute before it's available via the internet. HTTP 路由解決方案可以使用 Azure CLI 來移除。The HTTP routing solution can be removed using the Azure CLI. 若要執行此動作，請執行下列命令，並替代您的 AKS 叢集和資源群組名稱。To do so run the following command, substituting your AKS cluster and resource group name. 停用 HTTP 應用程式路由附加元件時，某些 Kubernetes 資源可能會留在叢集中。When the HTTP application routing add-on is disabled, some Kubernetes resources may remain in the cluster. 這些資源包括 configMaps 和 secrets，且會建立在 kube-system 命名空間中。These resources include configMaps and secrets, and are created in the kube-system namespace. 為了讓叢集保持乾淨，建議您移除這些資源。To maintain a clean cluster, you may want to remove these resources. 針對留在叢集中的所有 addon-http-application-routing 資源重複先前 kubectl delete 步驟。Repeat the previous kubectl delete step for all addon-http-application-routing resources that remained in your cluster. 使用 kubectl logs 命令來檢視 External-DNS 應用程式的應用程式記錄。Use the kubectl logs command to view the application logs for the External-DNS application. 記錄應該確認是否已成功建立 A 和 TXT DNS 記錄。The logs should confirm that an A and TXT DNS record were created successfully. time="2018-04-26T20:36:19Z" level=info msg="Updating A record named 'party-clippy' to '52.242.28.189' for Azure DNS zone '471756a6-e744-4aa0-aa01-89c4d162a7a7.canadaeast.aksapp.io'." time="2018-04-26T20:36:21Z" level=info msg="Updating TXT record named 'party-clippy' to '"heritage=external-dns,external-dns/owner=default"' for Azure DNS zone '471756a6-e744-4aa0-aa01-89c4d162a7a7.canadaeast.aksapp.io'." 這些記錄也可在 Azure 入口網站中的 DNS 區域資源上看到。These records can also be seen on the DNS zone resource in the Azure portal. 使用 kubectl logs 命令來檢視 Nginx 輸入控制器的應用程式記錄。Use the kubectl logs command to view the application logs for the Nginx Ingress controller. 記錄應該確認輸入資源的 CREATE 以及是否已重新載入控制器。The logs should confirm the CREATE of an Ingress resource and the reload of the controller. 系統會記錄所有 HTTP 活動。All HTTP activity is logged. W0426 20:30:12.213505       9 client_config.go:533] Neither --kubeconfig nor --master was specified. Using the inClusterConfig. This might not work. 移除本文中所建立的相關聯 Kubernetes 物件。Remove the associated Kubernetes objects created in this article. 如需在 AKS 中安裝 HTTPS 所保護之輸入控制器的相關資訊，請參閱 Azure Kubernetes Service (AKS) 上的 HTTPS 輸入。For information on how to install an HTTPS-secured Ingress controller in AKS, see HTTPS Ingress on Azure Kubernetes Service (AKS).